James Harnum provides counsel to unions, employees and boards of trustees on all aspects of pension and benefits administration and litigation. A significant part of his practice concerns assisting employees of insolvent companies in recovering amounts owed to them, whether for wages, severance pay or post-retirement benefits. 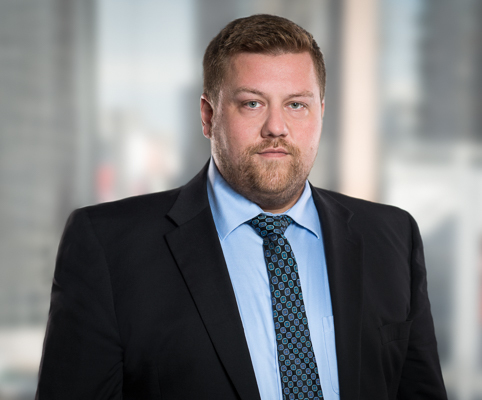 James also has experience in litigation involving the intersection of constitutional rights with labour and pension law. He has appeared before all levels of court in Ontario. James has served as an adjunct professor at Western University Law School, teaching the Pension and Benefits course. He has also lectured on pension law at the University of Toronto, Osgoode Hall and Queens. He is an editor of the International Foundation of Employee Benefit Plans’ Legal and Legislative Reporter, a frequent contributor to other industry publications and a regular speaker at conferences. James is also a member of the Ontario Bar Association’s Pension and Benefits Law Section Executive. James graduated in the top two per cent of his class at Osgoode Hall Law School, and is a proud alumnus of the Workers’ Rights Division at Parkdale Community Legal Services. He articled at the Court of Appeal for Ontario, where he clerked for Justice Eileen Gillese and Associate Chief Justice Dennis O’Connor. Hollinger Canadian Publishing Holdings Co.
We are one of the largest and most respected pension and employee benefits practices in the country, advising and representing unions, plan boards of trustees and other administrative bodies, employees and retirees in the leading pension, benefits and bankruptcy matters in Canada.